Make two presents :: I have a few different presents that I want to make this month. There are a couple that are computer based that I keep putting off but I'm really excited about them. If I'd just sit down and spend some time doing it! And then, I have a painting project and of course some sewing projects. Aggghh, so many projects...so little time! Figure out photo books :: So the boys are six months old. Yikes! And I still haven't figured out how I want to document our life. Double Yikes! I know that I want to do some type of photo books but I'm not sure if I want to do separate books for each boys (leaning against this because I'm probably not going to be successful at keeping up with 5 photo books a year some day!) or if I'm going to do one book per year. Whether there will be lots of text or just pictures. I have been debating on this since before the boys arrived and I need to go ahead and make a decision so I can start working on it. I was hoping to complete a few pages per month. Obviously, I'm already pretty behind. Fix playroom/craft room/office :: We have a room in our house that I spend more time in than any other room. It has our computer and office stuff in there, my sewing and monogram machine and then books, toys and baby gear. It is making me absolutely crazy. I want it to be cute and functional and inspiring. But instead it's a boring disaster. The room is a blah color. There isn't really any decor - just things that kind of end up here because I don't have a place for them elsewhere at the moment. And it's always cluttered. I'm so over it. And I'm annoyed that I spend more time cleaning up than actually creating in this space. So - May is my month. I'm going to embrace the challenge and get it right so I can't use it as an excuse to why I'm not sewing more. Plus, I apparently think that all the stars are going to align and life is going to be perfect if this room would just get fixed. Ha - I'm insane. Here are before pictures. I have absolutely no idea what I'm going to do - so PLEASE let me know if you have a great vision! Start a devotional book ::: I switch back and forth between doing a study and just reading chapters in the bible for my quiet time. I don't want to be dependent on another book to tell me what to think about the bible but other times I need more application in my life through a study. I haven't figured out what study I'm going to do - but I better get on it! I'm hoping to be pretty consistent with my quiet time this month - when I'm not consistent I notice a difference and I desperately miss this time in the mornings. Happy May! 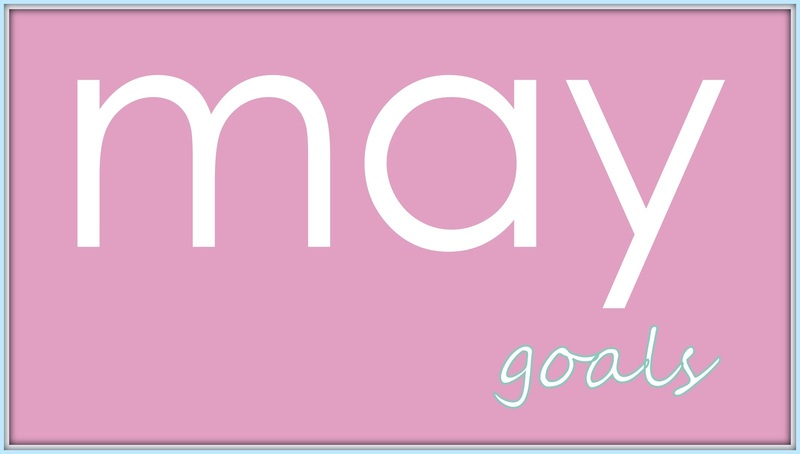 What are your goals for the month?